My kids have recently reached the age where they’re interested in chores, money, earning, saving… all of that good stuff. And as we started to dip our toes into the world of chores and piggy banks, I realized it’s not quite as straight forward as I had thought. So today we’re publishing the first in a series of posts on responsibilities and money management for kids – a super important topic in our book. Our hope is that you’ll get some good tips and resources and will also add your own wisdom in the comments below. After the meal is over, they ignore your pleas to do the dishes later and just start helping you carry stacks of dirty dishes to the sink. This kind of helper mentality is what I want to engrain in my children. When we live together as a family, there’s a lot of work that needs to be done. You don’t need me to remind you about the piles of laundry, the dirty bathrooms and the meals that need to be made. And kids don’t get a free ride on this train! We all need to help out. But, kids aren’t born knowing how to help. It’s something we have to teach them. Teaching children to help starts internally. At our house, each child is responsible for themselves. This includes making their own bed, putting their homework and lunch bag into their backpack before school, picking up their room and personal hygiene (brushing teeth, showers/baths, brushing hair). This stuff might seem like a no-brainer, but maybe you’ve been around someone that has to repeatedly ask their child to brush their teeth before bed. If we left it up to kids, they probably wouldn’t do it on their own. Our job as parents is to teach children to be responsible for themselves. So, the first part of being a responsible family member is taking care of all the things you personally need. Remember, this will be different for each age level. Toddlers might be able to pick up their toys, while elementary aged children can make their bed. So, find the things that your little one can do by themselves and teach them to do it independently every day. Once children are able to take care of themselves, they can start thinking about doing other jobs to help out the family. Some daily jobs might include helping to set the table, wipe off counters and put away their clean laundry. These are jobs that better the family environment and need to be done consistently throughout the day. A chore chart can help with reminding children which jobs need to be done. You can go high tech or simply hang the paper charts on the wall with the ability to check off the jobs as they’re completed. Who doesn’t get satisfaction from checking off a completed job? Also, If you are a pet-owner, you know that this member of the family cannot be taught to take care of itself. Instead, we teach our children to help with things like walking the dog, feeding the dog and picking up the dog poo. We rotate these jobs because some are less glamorous than others. Our dog is part of our family and the children are starting to learn to be responsible for not only themselves, but someone else. Sometimes we need to ask our children to go above and beyond the daily family jobs and do some jobs that might stretch them a little. Typically these jobs are done periodically, maybe once a week. Some examples of money-earning jobs in our house might be cleaning the base boards, washing the outside of the glass sliding doors or helping to clean out the fridge. 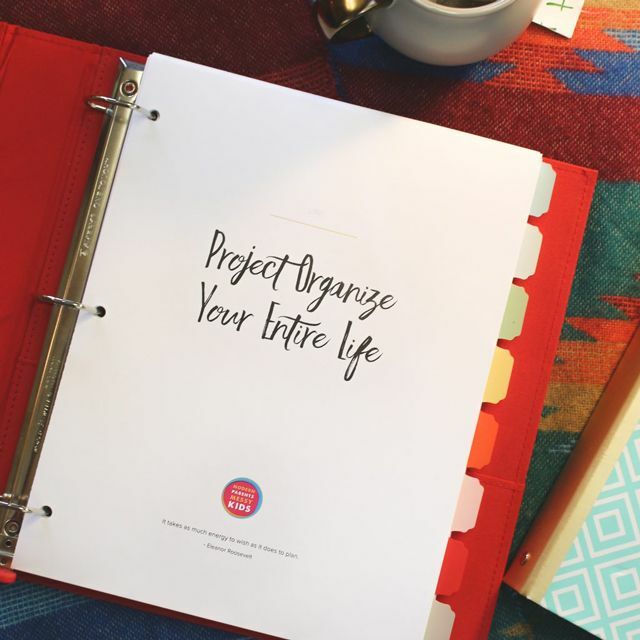 Think of it like your boss asking you to take on an extra project. It might seem a little bit intimidating, but the thought of a bonus inspires you to take on the task. Except for young kids – most of them will absolutely jump at the chance to take on responsibility AND earn some real life money. Family Jobs – teach a spirit of contribution and responsibility to the family. Money Jobs – teach critical money management skills by giving your kids practice in saving, budgeting, and even giving. If we stay consistent with teaching our children responsibilities, they’ll be the adult that’s helping out when help is needed. Remember, we aren’t born with these skills. Learning to take care of ourselves and be a contributor happens early on and we see the benefits as children grow up. Then please share with us in the comments – what responsibilities do your kids take on at home and how do you handle allowance? 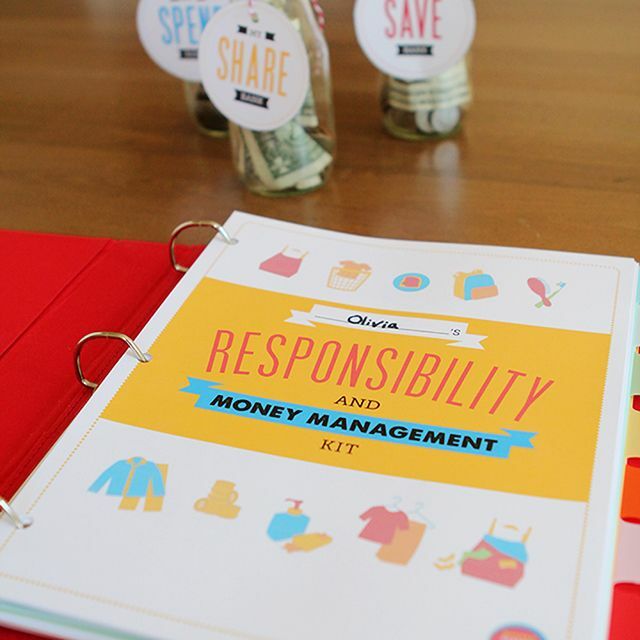 Kids’ Responsibility & Money Management Kits! Morning and Evening Routine Charts, Spend/Save/Share Banks Labels, Allowance Ledgers, Family Job Worksheets, Money Job Worksheets and more! I’m so excited about this – hope your family will love it as much as ours does!! Check out all the goods here.